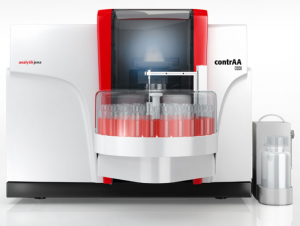 The unique technology of the contrAA® provides significant analytical advantages over the traditional Line-Source AAS. Thanks to the Xenon short arc lamp, that emits a continuous spectrum at high intensity, any element and wavelength can readily be analyzed whenever the requirement occurs. The high-resolution spectrometer with CCD detector produces a highly resolved absorption spectrum for each sample, allowing not only quantitative evaluation of but also qualitative information about the sample. 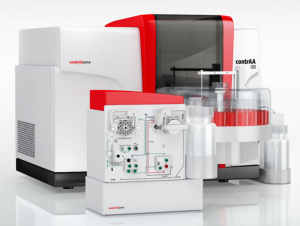 With features like fast sequential and simultaneous multi-element analysis — including semi-quantitative overview screening of unknown samples, and analysis of non-metals — contrAA® opens up new application fields. Modern correction algorithms for background and spectral interferences have taken productivity and accuracy of AAS to a new level. A Xenon short arc lamp provides a continuous emission spectrum across the entire relevant wavelength range used in AAS. Any element and any wavelength can be analyzed simply by software selection. This also includes molecular absorption bands, which can be used for the analysis of non-metals, e.g. the halogens or sulfur. At the same time secondary wavelengths are available to extend the dynamic range towards higher concentrations. The continuous spectrum furthermore enables screening analyses of unknown samples. The light intensity of the Xenon short arc lamp is significantly higher than with traditional light sources (hollow cathode lamps). It provides an excellent signal-to-noise ratio resulting in improved detection limits and better accuracy. Due to the high-resolution spectrometer and a CCD detector contrAA® 800 produces a highly resolved absorption spectrum for each sample. At a resolution more than one hundred times higher than traditional AAS monochromators, atomic absorption lines are displayed in their natural shape and width. Interferences from other atomic and molecular absorption structures are reduced to a minimum. Highly resolved spectra provide comprehensive and extremely detailed information about the sample. Their three-dimensional display in a 3D spectrum allows for a correct evaluation of the absorption lines and their spectral background. Furthermore it provides additional information about other elements present in the sample, which can be quantified simultaneously if required. Thus, the spectrum also provides a valuable tool for method development. Modern software tools facilitate data evaluation. An automatic background correction routine corrects spectral background and lamp intensity fluctuations by means of baseline evaluation. Direct spectral interferences can easily be corrected using matrix correction spectra. All necessary corrections are performed simultaneously, directly in the spectrum. The Dynamic Mode allows an automatic or manual adjustment of the dynamic working range of the instrument according to the concentrations encountered in samples. It enables a calibration over a concentration range of up to five orders of magnitude. 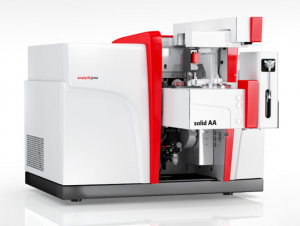 This allows measurements of ultra-trace- and major elements in the same sample with a single method. Thus contrAA® offers a dynamic range similar to that of ICP-OES instruments. Multiple sample dilutions are a matter of the past and an adaptation to higher concentrations is possible even if no secondary wavelengths are available.